If the thought of skydiving has ever crossed your mind (and you have the resources available to give it a shot): go. Now. You only live once, right? Alternatively, if the thought of skydiving makes you a little apprehensive, and you’re not sure whether you could pull it off, then you should give it a shot. Now. This is a fear you can definitely overcome, and the feeling of liberation you can achieve in doing so will likely ripple out in positive ways to other areas of your life. When my wife and I decided to go skydiving in celebration of our second anniversary, we were both of the former mindset. We were curious about skydiving, but never really got around to it. It just seemed like such a big deal, that we hadn’t had time to seriously consider it. Until earlier this month that is. And man, it was really easy and totally worth it. We found Skydive CNY on Google, and did the requisite search engine and website stalking to determine that they were legitimate. 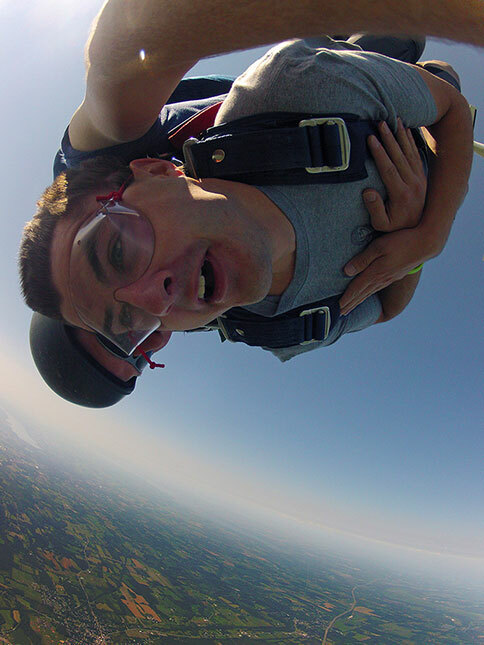 With the ability to both register and complete waiver forms online, we were booked for a tandem jump (meaning we would each be harnessed to a professional) within hours of beginning our search. We scheduled it a couple weeks in advance. Then on July 11 we trekked to the airfield, received a few minutes of training regarding how to exit the plane and hold our arms, suited up, boarded the plane, and were off. After 15-20 minutes of flight over the gorgeous central/western New York countryside with four Finger Lakes visible just to the south, the instructors popped the door open, and out we went. Probably to keep nervous customers from chickening out, the instructors went at lightning speed; there was no time to rethink what you were doing. The sensation of a free fall is impossible to describe, as there simply is no comparable experience. The peaceful gliding following the deployment of your chute is also an incredible experience, but let’s be honest: the real joy of skydiving is the 120 mph you achieve falling out of an airplane! The whole experience was absolutely worth it, and not just because of the thrill in the moment. Being able to discuss the experience with others after the jump and to see their reactions has been incredibly empowering. If only for that self-esteem boost, I’d recommend anyone who is physically and financially able should give skydiving a chance — particularly if it scares you a little bit. Just imagine how invincible you’ll feel when you’ve landed safely back on the ground! 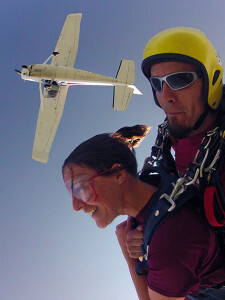 Tandem skydiving is done while strapped to a professional. You’re not asked to do much. Just listen and do as you’re told, and you’ll be fine. The heights are too surreal to make you pause. If you’ve ever stood at the edge of the Grand Canyon, trying to believe that the incredible mosaic in front of you is in fact real, you’ll recognize this phenomenon. As you prepare to exit the plane, the ground is so vast, and so far away, that your brain doesn’t really comprehend it as a height. While dangerous, it’s not really that dangerous. Katie asked Jeff, the professional with whom she jumped, how many times he has jumped. His answer: roughly 7,000 times. And he’s still here, still jumping. That’s a pretty good success rate. In fact, the Skydive CNY website says that all of their instructors have 4,000 to 16,000+ jumps under their belts. For the sake of comparison, National Geographic claims there is a 1 in 3,000 chance that you will be struck by lightning in your lifetime.